Hey guys! Since i am officially not having class till my graduation this mid year, i decided to do some challenge for myself. Few days ago while i was on www.whowhatwear.com to read some fashion news, this article about 30 Tiny Ways to Dramatically Improve Your Look Now just caught my attention and i decided to join in! Well actually i am not gonna follow 100% of the style from day 1 till 30, yet i will do the challenge randomly, include all the key items and probably change something accordingly. Here is my day 5 look! 3 degrees was actually freeze me out in this low cut sweater and jeans. However, i am trying to pull out this look so that it looks good for the eyes. 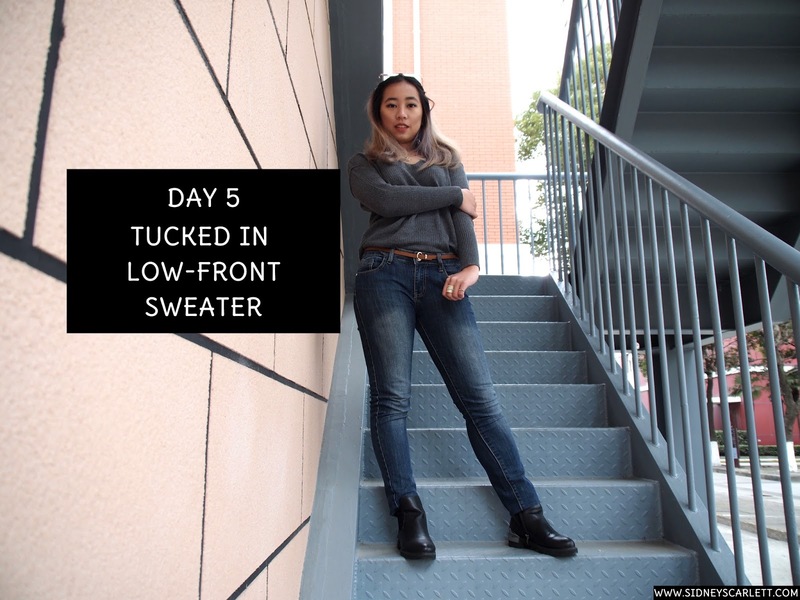 The theme today is about to get a more polished look with your sweater being tucked in to the pants. Most of the time when i am in my sweater, i will never have the time to bother about tucking the hem inside of my pants. In my opinion, somehow sweater are mean to be super comfy and messy, so that you can just chill with it and look sporty in it. After some time, i realized that sweater could really pull off a trendy theme and by not looking too messy, you could be polished in a basic grey sweater. Plus the accessories, i love several pendant on one necklace, since it looks beautiful, unique and the sounds which these pendants are making when they run into each other. The pendants are shell, seahorse, and the wheel of ship, which is kind of marine-themed. The multiple layer ring is actually my mom's, until i realized that it looks quite good on me and i fancy the way that marble layer sparkle and i decided to take it for me. haha well, since my mom rarely use this and she got lots of rings, so giving it for me wouldn't be a problem at all. Pstt, i am a sucker for silver rings especially with statement shapes. You know what i like about placing sunglasses over your hair? That it could actually hide your bad hair day, literally it works like champion. Beside hats, ponytails, braids, or other head accessories, sunglasses are my go-to as well, when you don't need to think and just take it and you are done with the polished look. Plus, it could hide your eyes whenever its tired or doesn't feel like showing it off the camera.